Having visited many of the private game reserves in Sabi Sands, MalaMala is my first choice. MalaMala is in fact not part of the managed area of Sabi Sands anymore, but it is still part of the general cluster of parks. This park is much bigger than any of the other parks in Sabi Sands, which means less vehicle traffic. This is even more true because they don’t give out any traversing rights to neighboring properties, like most of the other parks do, which makes for less vehicles and a more exclusive experience. As is the case in the rest of Sabi Sands, drives are centered on the Big Five and sightings are excellent. They seem to take things to extremes when they hand over a Big Five certificate. The lodge is very simple compared to many of the extremely fancy establishments in most of the private game reserves. Although, I like luxury as much as the next woman, I like the idea that the emphasis is still on game viewing and not shifting too much towards fine dining and home décor. My favourite wildlife destination in South Africa, legendary MalaMala pioneered the modern private reserve experience when it opened its gates to paying clients in the 1960s, and for many years it was the ultimate safari destination for the rich and famous. Superficially, it offers a familiar formula to the neighboring reserves of Sabi Sands, but with the crucial difference that no traversing rights are granted to other reserves, and it is much larger in area, extending over 130 sq km, and boasting 20km of perennial river frontage. As a result the vehicle density is very low compared to other most private reserves, making for a more relaxed atmosphere for game viewing. And the wildlife is truly superb, with all the Big Five typically recorded on more than 350 days of the year, and an incredible average of 4 separate leopard sightings per day. I also love the unpretentious Main Camp, which eschews the modern trend towards ever more stylish boutique, and the fact that management places no restrictions on game drive hours – you can stay out all day if you want. It isn’t cheap, but nobody with a passion for wildlife will regret the expenditure. For top-notch wildlife-watching in beautiful, pristine surroundings, I think MalaMala, immediately west of Kruger National Park, is very hard to beat. The MalaMala team make the classic luxury safari experience seem effortless, with minimal fuss and absolutely no gimmicks. Don’t expect cutting-edge décor – the lodges here are reassuringly conservative – but do get ready for some astonishing encounters with leopards and other charismatic animals. At 135 square kilometres, this is by far the largest private concession in the Sabi Sands Reserve, but visitor numbers are strictly limited – MalaMala’s vehicles have exclusive access. The Sand River, which slices through the western edge of the reserve, flows all year round; the unspoilt expanses east suppport a terrific variety of species. It’s a formula which draws well-off wildlife lovers from all over the world, including celebrities, photographers and film-makers. Together, they have made the place world famous, and in my opinion it really does live up to the hype. There are three places to stay, all in superb riverside locations. MalaMala Main Camp is really a lodge rather than a camp, and might feel too much like a hotel for some, but is relatively affordable; Sable Camp (again, a lodge) is a mini variation on the same theme, and Rattray’s, named after owner Michael Rattray, has the feel of an elegant homestead. Sandwiched between the Sabi Sand Private Reserve and Kruger National Park, 13 300 ha (33 000 acres) Mala Mala has been a private game reserve since 1927. One of the oldest luxury lodges in Africa it has welcomed filmstars, the jetset and wildlife filmmakers since the 1960s, earning itself a global A-lister reputation. With a 19 km (12 mile) unfenced border along the national park and the Sand River running through the property, it is extraordinarily game-rich. And unlike the rest of the Sabi Sand area, this is not shared – Mala Mala keeps their huge area exclusively for their own guests so there are never more than three vehicles at any sighting. Everything here is very slick and glossy. You are assigned a ranger on arrival and he not only takes you on all your drives but eats with you and as host and concierge throughout your stay. Meals are taken in discrete groups not country house style so if you want the camaraderie of travellers’ tales and lion kills around the campfire, this may fall short of expectations. For me, on my own, it wasn’t ideal – but then if you are on your honeymoon and want to gaze into your beloved’s eyes, it might be perfect. The main camp, Mala Mala Camp, has an excellent kids’ programme that teaches them basic bushcraft, how to use a radio, cook in the bush – and about wildlife! And you can get pampered to your hearts content. On the down side, Mala Mala still doesn’t seem to have any visible community outreach programme when so many of their neighbours are pouring money and resources into local development. Imagine Kruger without the crowds, with some of the best guides on the continent and almost guaranteed sightings of lions and leopards. Mala Mala and the contiguous Sabi Sand reserves are rightly famed for their leopard sightings – the 2001 National Geographic documentary Stalking Leopards was filmed here – not least because the riverine woodland that snakes through the reserve is perfect leopard habitat. The guides here know their leopards, with which they are generally on first-name terms, and the lion prides, too, are well-known and routinely found. Mala Mala’s fame means that its accommodation is both pricey and often booked out well in advance. 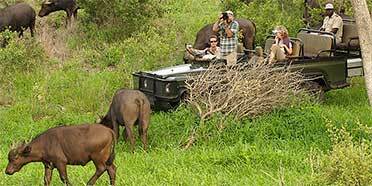 But once here, the reward is one of Africa’s better wildlife-watching experiences.